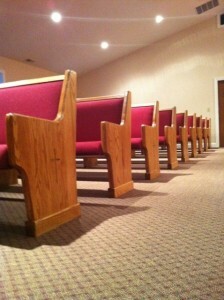 Caring for your church pews and keeping them in good condition can mean many more years of use. 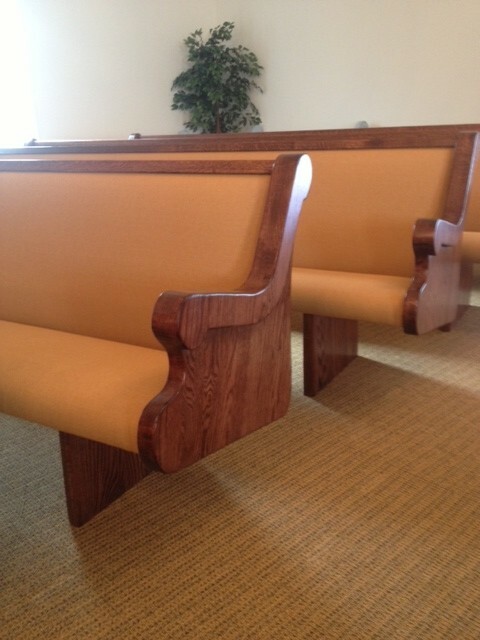 Our church pews are made out of solid oak, so you can follow the general rules for caring for solid oak furniture. Ask your Altar Guild, maintenance team, or sexton to dust and clean the pews regularly with wood cleaners to keep them in top condition. Churches are not quite the same as homes, of course, so there are somepredictable differences in upkeep. Many people, including a lot of children, just don’t know what can damage solid oak, so church pews can require some maintenance you might need to do that you may not encounter in a normal household setting. First, make sure never to use detergents or regular soaps on your church pews as this can damage the wood grain. Detergents can break down wood over time and dry out wood grain, causing cracking and ragged looking wood. Instead, use a soft cloth dampened with wood cleaner to clean church pews. We recommend using Minwax’s cleaners as they’re made to go with Minwax finishes that we use on our church pews. Oils, dust, and grime can be easily cleaned from wood as long as cleaning is done routinely. Church pew maintenance problems usually come from more unusual circumstances. Occasionally, children might draw on the pew itself with crayons or stick gum underneath the seat. These situations call for a bit more elbow grease than just a soft cloth! To remove crayon, use a terry cloth with a wood cleaner and try to remove the crayon by scrubbing it. If it still won’t come off, try putting a dab of WD-40 onto a clean rag. Make sure to test it on an inconspicuous spot first, like under the seat, before using it on the pew back. If it doesn’t affect the pew’s finish, use it on the crayon marks till they are removed. Be gentle, even if it seems like it’s not working at first, so you don’t damage the wood. Make sure to then clean the spot thoroughly with cleaner and apply wax, if necessary. For gum, seal some ice cubes and salt into a plastic bag and place it on the gum for about ten minutes. Once it’s cold, the gum will harden and be easier to remove. Of course, if your pews are cracked and ragged, they probably need some more care than just cleaning and need to be refinished or replaced. Contact us at Born Again Pews to discuss your needs.